Waterfalls in Nepal / Top 10 Waterfalls popular waterfallis of Nepal. Waterfalls are the beautiful creature of nature. A waterfall is a place where water flows from the steep high hills or mountains and falls below. Normally waterfalls are formed in the upper course of steep mountains. There are different reasons for the creation of waterfalls. Formation of land also causes waterfall if there is a cliff then rushing water automatically falls down over the edge. One of the beautiful falls, Pachal waterfall is counted among the highest waterfalls of Asia. This waterfall is located in Kalikot district, Karnali State of Nepal. It is in the rural hill part of Nepal. This fall is about 481 meter. This is really a beautiful waterfall as you can see water falling directly from inside the dense jungle. Being the top waterfall of Asia many tourists come to visit here. Rupse fall is one of the most beautiful waterfalls of Nepal with a height of 300 meters. Situated in the Dana VDC, Myagdie district of Nepal it is about 110 km from Pokhara. This waterfall passes through the world’s deepest canyon Kali Gandaki George of Nepal. These falls have got tremendous beauty around it. From the partition of high hills, this falls itself flows from there. This fall is fully surrounded by the lush green forest from everywhere. As waterfalls in a very speed from the great height, the water seems to be as white as milk. Rupse fall is one of the good tourist attractions. Located in Pokali VDC of Okhaldhunga Nepal, Pokali waterfall is second highest waterfall after Pachal. This waterfall has a height of almost 130 meters from the ground level. Surrounded between the lush green forests this waterfall is ultimately breathtaking. One should not miss seeing this fall while visiting Okhaldhunga. It is also one of the attractive tourist destinations. Bhotekoshi is about 70km east from the Kathmandu Valley. Bhotekoshi is a river which is popular for rafting and canyoning. This river originates from the Tibetan tribe. In Bhotekoshi there are many small and big waterfalls throughout the rivers. 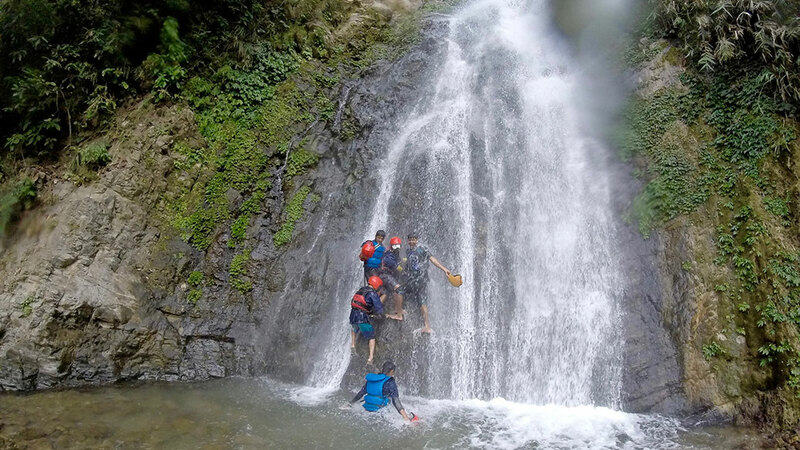 And all the waterfalls, canoeing, and rafting on Bhotekoshi are full of adventure, experience and thrilling. Lots of tourist, as well as domestic people, come to visit this waterfall. This is one the beautiful waterfall of Nepal. Although there are lots of big and small waterfalls in Nepal among all of them Davis Falls is one of the most popular waterfalls of Nepal. This waterfall is located at the famous and beautiful city of Nepal Pokhara which is in Kaski district. The official name of this waterfall is patale chhango. It is really a unique waterfall where water directly goes into a deep and narrow tunnel and it does not have any ends. It is believed that this fall took the life of a tourist named Davis, he fell down into the canal and still not found. Hence, the fall is named by Davis fall. Monsoon season is the best time to view this breathtaking sight when it is high rainfall. Annapurna Roadside waterfall is one of the unique and beautiful falls that lies in the hill part of the road. People of different countries and locals came to visit this waterfall of the roadside. People traveling along that road can also get to see the waterfall. Water directly falling from the top of the hill surrounded by dense forest and green grasses it really looks stunning. It is one of the great creatures of nature. Mustang district is very famous for the holy place as thousands of foreigner plus local people visit the Mustang district to worship in Muktinath temple each year. There are few icy waterfalls in the upper mustang which are incredibly beautiful. People visiting get enjoyment by seeing those beautiful, pleasure-giving waterfall. Waterfalls become more beautiful in monsoon season. Varun Valley is a beautiful valley of Nepal which is situated at the base of Mount Makalu in the district of Sankhuwasabha. It is the virgin place to visit in the Himalayan region. This valley provides stunning contrasts, where high waterfalls cascades into deep gorges, craggy rocks which rise from dense green forest along with the colorful flowers bloom beneath white snow peaks. This beautiful falls falling from the hills is ultimately beautiful. Located in the Kaski district of north-central Nepal Lwang Ghalel is a small village of Gurung Caste. The beautiful village is a popular destination for tourist. After Davis Fall, Lwang Ghale waterfall is another attraction of Kaski district. This Lwang Ghale is popular for short hiking, canyoning, and view of different beautiful Himalayan range. Sundarijal is a delightful place of Nepal and about 9 miles far from Kathmandu you can find a beautiful waterfall. The fall is really beautiful and it can surprise you. This place is a village area and you can also get the chance to see the culture and tradition of the village people. For the best result, you should watch out this beautiful fall.